I love one-dish wonder meals. 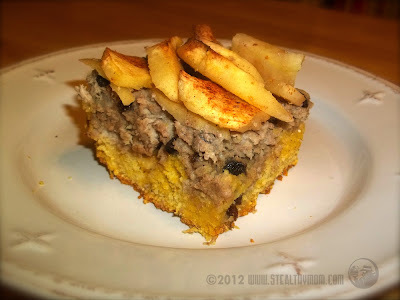 This one combines homemade cornbread with fresh apples and pork to bake all at once. If only there was a way to share the aroma... It is fun to see the boys eat this. G-man slowly and meticulously reconstructs every bite on his fork to be a miniature version of the casserole. The Cadet, whom we sometimes call "Baby Carnivore," eats the meat first, then the cornbread, and the apples last. Whatever works. Preheat the oven to 375F. Grease a 12x12 baking dish with either coconut oil or a spritz of olive oil. In a bowl, mix the masa harina, cornmeal, baking powder, salt and black pepper together. Add the egg and water and whisk well. Spread the batter into the bottom on the baking dish. Mix the pork, currants, cinnamon, ginger, garlic and cumin together. Spread over the cornbread batter. Top the pork with apple slices. Arranged overlapping, they will keep the pork from drying out. Sprinkle with cinnamon and pour half a cup of water over top. Bake for about forty-five minutes. If you cover the dish, the apples will be softer. *non-GMO corn-based ingredients can be a challenge to find. Bob's Red Mill offers masa harina, Hodgson's Mill offers cornmeal, and Rumford offers baking powder. There are other brands out there; these are the most common in grocery stores in the midwest. I shared this link with Fight Back Friday, Monday Mania, Fat Tuesday and Slightly Indulgent Tuesday.